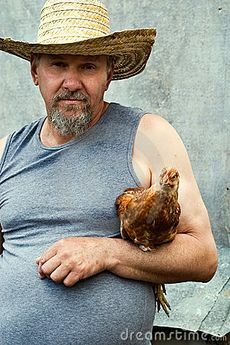 Cheesemonger Dave Janikowski with his pet chicken "Aaron Rodgers"
Boonies, WISCONSIN: Despite Congress's record low approval ratings, a new poll by CNN and Reuters has found that one American still holds Congress in favor: Dave Janikowski, a dairy farmer from Northern Wisconsin. Janikowski, who admits that he's "not really one for politics", says he believes that Congress is doing "a decent job". Janikowski is unique among Americans in that he harbors no feelings of extreme disgust or contempt for his representatives in Washington DC. The good news comes just days after a vote in Congress found that all 535 members of both the House and Senate disapprove of themselves. Representatives are now thrilled by the prospect that there might be one individual in the nation who doesn't unconditionally hate them. "Let's be honest now," said Speaker Boehner. "Our current approval ratings are lower than spam email, appendectomies, and the DMV. If Dave likes us, that's a step in the right direction." Members of Congress have announced plans to change their policy to appeal to Mr. Janikowski. "We can't afford to lose Dave's support," said Senate Majority Leader, Harry Reid. "All our legislation from now on will pander to Mr. Janikowski's best interests. Hopefully these new policies will lead to a turn around in public support." True to Reid's word, Congress has ceased debating on the monumentally important Obamacare bill, and has started discussing "Davecare", i.e., ways to increase their approval among the Dave Janikowski demographic. Tomorrow, the House of Representatives will vote on a bill entitled: "Resolution to give Dave Janikowski $100,000,000". All signs point to both the House and the Senate unanimously approving this bill. However, as the money will likely be taken from federal coffers, it may increase the already large national deficit. When interviewed about the massive amounts of national attention he has received, Dave said he appreciated the sentiment, but that he didn't want the spotlight on him. "I don't know much 'bout what goes on down there," said Dave. "Reckon it doesn't really concern me". Dave also humbly asked Congress to "stop sending him stuff". His small ten acre farm currently lacks the facilities for the private jet, collection of rare Michelangelo frescoes, and several metric tons of diamonds that Congress has sent him. An auction to dispose of these unwanted items will be held at his farm later this week. Congress hopes that their recent success with the Dave Janikowski demographic will help them gain momentum and raise their overall approval rating by a few hundredths of a percentage point. However, Davecare may not go into action, as president Obama has vowed to veto any piece of the Davecare bill, calling such legislation "stunningly retarded". We will continue posting updates as this story unfolds. This page was last edited on 5 June 2012, at 07:27.